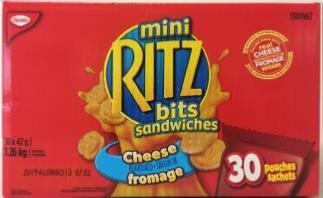 Christie brand Ritz Bits Sandwiches in cheese and pizza flavours sold across the country are being recalled due to possible Salmonella contamination, according to the Canadian Food Inspection Agency. The packages come in sizes of 1.26 kilograms, 180 grams and 42 grams. The products are made by Mondelēz Canada. Recalled products should be thrown out or returned to the store where they were purchased, CFIA said in a food recall warning. Food contaminated with salmonella may not look or smell spoiled but can still make you sick, the agency said. Young children, pregnant women, the elderly and people with weakened immune systems may contract serious and sometimes deadly infections, the agency said. Healthy people may experience short-term symptoms such as fever, headache, vomiting, nausea, abdominal cramps and diarrhea. Long-term complications may include severe arthritis. CFIA said the recall was prompted by a recall in another country. It is conducting a food safety investigation, which it said may lead to the recall of other products.